You know, catfish has somewhat of a bad reputation, but I think this is unfair. Catfish is not only yummy when prepared just right, but it’s healthy too! After all, it has lots of omega-3s and omega-6s, almost 16 grams of protein per serving, and lots of B-12. It’s also relatively low in mercury too compared to other commonly eaten fishes. 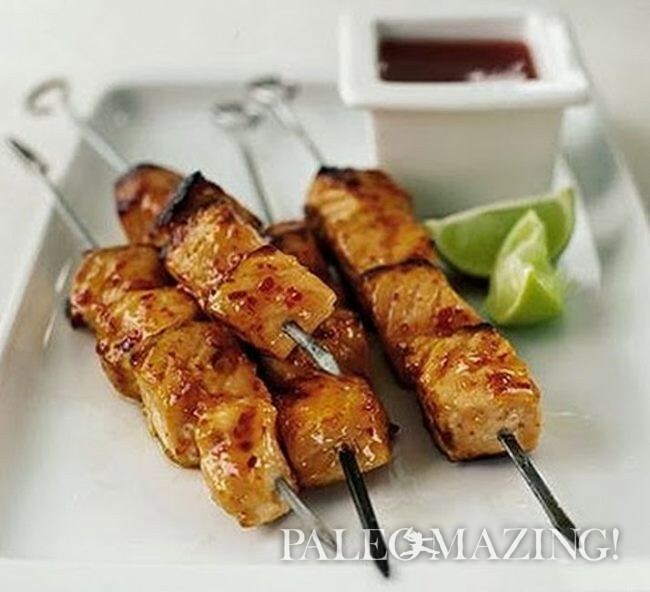 I think seafood is an important part of a paleo diet, and this recipe for paleo thai food catfish skewers & yummy cabbage slaw is a great way of incorporating it into your meal plan. I encourage you to check out my paleo fish and seafood recipes and share your own with me through my Contact page! You know, catfish has somewhat of a bad reputation, but I think this is unfair. Catfish is not only yummy when prepared just right, but it’s healthy too! Read up on the health benefits above or google it. I think you'll really enjoy this delicious recipe. Reserve ⅓ cup for savoy cabbage slaw. Pour remaining marinade into a large food-storage bag and add your fish fillets. Refrigerate for 1 to 2 hours, turning bag once or twice. Place the reserved ⅓ cup marinade in a large bowl. Add cabbage, cucumber, bell pepper, vinegar, and salt. Refrigerate for 1 hour, tossing occasionally to combine. Wipe excess marinade from filets with a paper towel. Toss mint into slaw and serve with the Thai catfish skewers. This is an adaptation of a recipe I read in a magazine and unfortunately I do not recall which one it was as I tore it out of the book in my pile of “try these out one day” recipes. I altered it somewhat to ensure it is gluten-free and sugar-free and spicy optional, yet removing the spice would defeat the purpose.